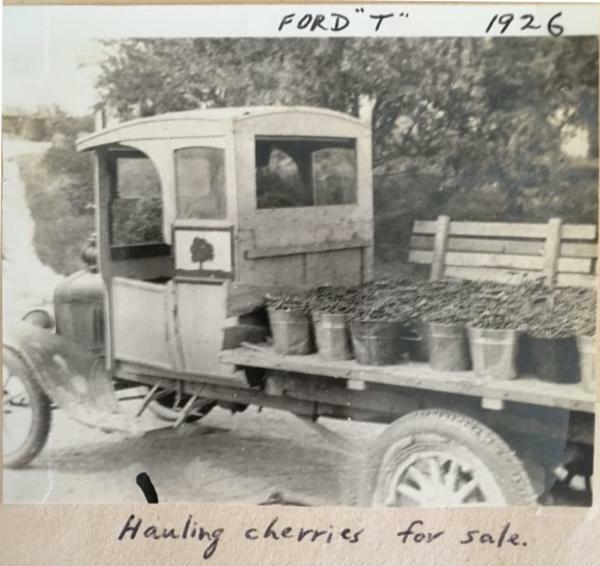 Photograph of a Ford Model T Truck Hauling Cherries from the Brown Fruit Farm is a picture, with genre photograph. Its dimensions are 7.21 in. x 7.69 in.. It was created in 1926. The Brown Fruit Farm operated north of Worthington for nearly fifty years, from around 1912 to 1958. The farm grew and sold apples and apple products such as juice, candy and apple butter, as well as cherries, plums and honey. As of 1925, the farm encompassed 100 acres planted with 4000 fruit trees and was the largest fruit farm in central Ohio. It was renowned not only for the quality of its produce, but also for its innovative roadside marketing, including signs telling motorists how many miles they were from the farm. The farm’s original apple orchards were planted around 1901, by Frank Bower, on property once owned by the Pool family. Sally and Joseph Pool came to Sharon Township in 1812, and their family gravestones have been incorporated into a restored cemetery at Highbanks Metro Park. Bower sold the orchards to William C. Brown in 1909, who few years later turned the property over to his son, Frame. Over the next couple of decades, Frame grew the farm with cutting-edge farming and marketing techniques. Frame and his wife, Marie, and daughter, Molly, lived in the old farmhouse on the property that had been built by the Pool family. Frame and Marie Brown both passed away in 1936, when Molly Brown took over ownership of the farm, which operated until 1958. It covers the topics agriculture, food and drink, cars and transportation. The Worthington Memory identification code is wcd0283. This metadata record was human prepared by Worthington Libraries on February 23, 2018.